How many more books do we need about the American War in Vietnam? Steve Sheinkin’s Most Dangerous: Daniel Ellsberg and the Secret History of the Vietnam War proves there is room for more. As Viet Thanh Nguyen’s The Sympathizer showed, there’s still plenty of scope for Vietnamese perspectives in the English language to hit our shelves. While Steve Sheinkin is American, what makes 2015-published Most Dangerous: Daniel Ellsberg and the Secret History of the Vietnam War different to others is not just that its focus is on Daniel Ellsberg, of the Pentagon Papers fame, but that it’s written for children (depending on who you read, either from 10 or grade 7 up). Sheinkin tells the story of the war mostly from the perspective of Ellsberg, a Pentagon analyst who also toured in Vietnam, seeing firsthand a part of the situation on the ground. While once believing in the moral correctness of US foreign policy, he eventually comes to be angered by successive US administrations and presidents lying to the American people about their involvement in the war: “Each president, of course, had hoped to win, and had wanted to win. And yet what the Pentagon Papers showed was that each president made decisions to escalate American involvement in Vietnam knowing that what he was doing had little chance of success,” Sheinkin writes. Analysts put together the some 7,000 pages of history at the behest of Secretary of Defense Robert McNamara, who wanted to create a written record for historians that would ensure mistakes were not repeated by future administrations. Ellsberg helps write and has access to the papers, which he surreptitiously copies. 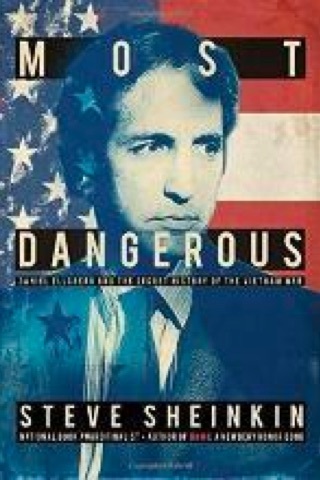 This is a gripping tale that extends to Nixon’s Watergate, Ellsberg’s trial and the withdrawal of troops from Vietnam. At one point, Ellsberg confronts National Security Advisor Henry Kissinger as he gives a speech, asking pointedly: “What is your best estimate of the number of Indochinese that we will kill, pursuing your policy in the next twelve months?” Kissinger can’t answer. As it turned out, 58,193 Americans died in Vietnam and more than 300,000 were wounded. The death toll of Vietnamese soldiers and civilians from 1964 on was estimated to be at least two million. One aspect of the story that is interesting are the complicated logistics involved simply in photocopying the pages; today they could have been saved to a finger drive or the cloud in a few seconds. The cloak and dagger antics involved in getting Ellsberg, for instance, to meet with Walter Cronkite (who had to wait by a hotel phone), is fascinating, as is the fact agents at one point planned to slip LSD into Ellsberg’s soup. Though this is more a tale focused on American democracy and the testing of its limits than Vietnam as a place itself, if you do have even a slight interest in the war between the two countries as you travel, this is a fascinating read, and more relevant than ever given today’s geopolitics. Sheinkin may have written this with children in mind, we didn’t feel for a moment he was talking down to us—it’s a gripping read in its own right (we think it’d be a pretty challenging read for a 12-year-old, but there’s no reason they couldn’t tackle this). What we found most alarming in the story was the brutal disconnect between the decisions of those in power and the impact ordinary people feel on the ground, sometimes thousands of miles away; we reckon this disconnect has only grown greater with time and technology. Read this book to reflect on how one person really can make a difference and to see how just a few decisions within a democracy can have devastating consequences that echo down generations.